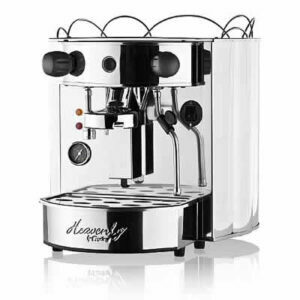 Presenting the Heavenly by Fracino, creators of the world’s most powerful espresso coffee machines. These manual fill machines are contemporary, compact and perfect for venues short on space and where plumbed water is not available. Sleek, elegant and dynamic, they are the latest low volume professional/semi-professional coffee machines and are reliable, durable and user-friendly. It features a high-powered element and a full sized commercial group, ensuring the finest coffee is produced. The Heavenly uses ground coffee, pods or capsules. You can make two drinks, whilst steaming milk simultaneously. This modern, well-designed coffee machine is suitable for a site requiring 50-70 coffees per day. Impress your visitors; transform your salon, office, boutique, bar or home with the Heavenly by Francino. A black rocker switch, allows the user to control the amount of coffee being dispensed. Pod and capsule adaptor available on request. Semi-professional, Manual fill, one group machine, perfect for the home, office or small venue. Useful function-make two drinks and steam milk simultaneously. 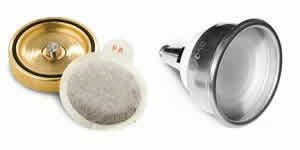 Consistent temperature and smooth extraction with full size, thermosyphonic, brass-bodied coffee making group. Electronic water control and pressure gauge. High-quality copper boiler, heated by multiple looped elements. Thermosyphonic circulation ensures group kept at the constant temperature for perfect coffee making every time. Audible alarm indicates when the tank is low. Power shut off feature to protect the element when the boiler water level drops. Brass bodied group with stainless steel shower plate, solenoid valve and a high-pressure pump. Easy to clean, stainless steel steam tubes.